Delphos resident Denny Wieging expressed concerns about the proposed widening of 5th Street in Delphos. DELPHOS — Delphos City Council has delayed a vote on widening 5th Street as 1st Ward Councilman Andy Daley could not attend the meeting Monday night. Daley asked, via letter to council, for the vote on this to be delayed to its next meeting February 25, when he could be present. The project has been contentious at recent meetings with many residents expressing opposition to the project. The proposal would see the corridor go from a four-lane to a three-lane roadway, allowing for a middle turn lane and a bicycle lane. The total cost of the project is estimated at $3.6 million, $2.1 million of that will come from outside sources. In 2015, the Ohio Department of Transportation approached the city about their intention to resurface the roadway and as time went by, the scope was expanded to include new drainage and curbs. At no time did ODOT mandate a bicycle lane. Instead, that was something the City of Delphos came up with when exploring additional sources of funding for the project. During an open discussion from Delphos residents Mike Edelbrock and Denny Wieging weighed expressed their concerns about the project. “It’s a nice idea [the bike lane] but I don’t think it will be used that much. I think a turn lane might end up being a passing lane,” said Edelbrock. “If our tax dollars are being spent for this project, shouldn’t it be for something we want? The bike lane for 5th Street is dangerous,” said Wieging. He suggested finding an alternate route for the bike lane that would go by Delphos landmarks like The Creamery, the Postal Museum or the Catholic church. “Leave it as it is — four lanes,” said Wieging. Wieging even threatened a citizen referendum if it’s passed. “I understand the community is split on this. Can we afford to do this?” said Scott Wiltsie, councilman at large. 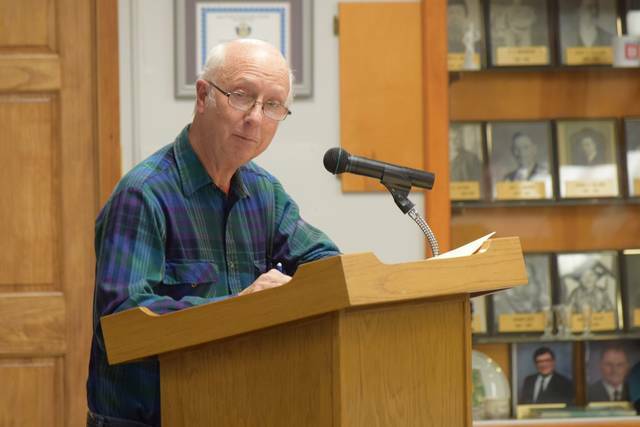 https://www.limaohio.com/wp-content/uploads/sites/54/2019/02/web1_delphosvote.jpgDelphos resident Denny Wieging expressed concerns about the proposed widening of 5th Street in Delphos.